Or perhaps they learned their lesson and stopped collecting what they considered to be souls. Maybe they died out. That'd be something. Would they try to capture themselves in their globes if they sensed the end of their race? Or perhaps whatever sensation the Soul Hunters have regarding when a person dies occurred for them when Sheridan was on Z'ha'dum and not when he "simply stop[ped]" at the end of the series. I can easily imagine the Soul Hunters would choose to avoid Z'ha'dum and the Shadows even if they wanted Sheridan. I think that would make for an extremely interesting story. Perhaps in the distant future (I think it would ruin a lot of fun if you did it so early in the timeline), a distress signal is emitted from the Soul Hunter home planet. The message is picked up. The alliance arrive to investigate what has happened. However after teams arrive on the surface , they find a planet devoid of humanoid life but completely filled with an endless sea of Soul Hunter galleries. Soul Hunters in varying states of decay are strewn across the surface and in buildings. While the investigation is being carried out, the other recipients of the message... the last remaining Soul Hunters from the edge of known space... arrive on the scene in previously unseen capital ships (that house their smaller one man vessels). A fierce skirmish takes place above the planet. The last Soul Hunters have come to protect the vast collection knowing they are the last of their kind... and mistake the Alliance for grave robbers. the situation would be further complicated by characters among the Rangers who sympathised with a view akin to Delenn's. The troubled Ranger Captain would then have to contend with the heated disagreement. In the end it would become apparent that the Soul Hunters couldn't approach their own planet because of the disease that killed their own kind. The resolution would be that someone from the Ranger crew would volunteer to stay behind and act as custodian to the soul galleries.... possibly the doctor as some of the Soul Hunters hadlanded on the planet and contracted the early stage of the disease and he agrees to both protect their assets and do what he can to save the sick. The alliance and soul hunter fleets would fly off at the resolution. Its funny I could not feel any sympathy whatsever for this Soul Hunter guy in that b5 episode. But I kind of got to like the Soul Hunters a little in River of Souls, especially the one played By Martin Sheen, He sacrificed his life to try to help all of those souls in that sphere, In their own way they believe that what their doing is for the greater good ,but their way of thinking also proves the old adage That the road to hell is paved with good intentions. The actor who played the Soul Hunter in the B5 episode was very intense: I could buy that this race (and this particular individual) lives entirely for one thing: capturing souls of interest to them. The more sympathetic soul hunter stuck me as being a bit too sympathetic. But another point: even the second soul hunter we see in the b5 episode seems more sane and rational than the first, and comments quite clearly that his collegue went insane. In any event, I think of all the soul-hunter actors, the first we saw was the best. Worst ep of B5 by a mile. Even grey 13 is missing is better than this! Hated the story. It was unconvincing. (still find all soul hunter eps crap, though I'm probably biased - see previous!). The souls are "unconvincing". I found parts of the script too cheesy to bare watching. The props were terrible - the soul taker machinery thing, dear dear. etc. etc. I left thinking - another disappointing sci-fi in the making. JMS was his own worst enemy letting this drivel out at the 2nd ep. Last edited by mattikake; May 19th 08 at 17:47. It explicitly states that there's no way whatsoever to know if what the Soul Hunters "captured" were actually souls. The story is very upfront with Franklin saying that, given the right level of technology, it'd be theoretically possible to copy a person's brain patterns, thus effectively copying a person's mind. But there's nothing in the episode that says "These are definitely souls." Last edited by vacantlook; May 19th 08 at 17:53. (apart from the ep title? ) Yeah I know, but the implication is there along with a massive wedge of stinky matured cheddar. Every person will view an ep of any series with their own personal take on it. Whether they should or shouldn't is irrelevant - they will. It will take probably until the middle of series 4 to work out that JMS gets his characters to tell no lies in the story telling, where Soul Hunter can be taken less... chessily. Most people will only take the ep at face value on first viewing, as I did, and see a guy who hunts for souls. Please... It makes Star Trek look realistic. The thing that pains me is that Sci-fi is viewed as sad and nerdy by most people (who of course haven't given it a fair trial), but this ep comes in as number 2 after you could've spent weeks, months or even years to get someone to watch it because you know they will find it great, then JMS dumps this stinking pile of nerdy script and Blake's 7 quality props. It's not even very significant for later eps. Is it to test your resolve? 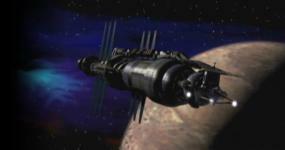 The start to B5, the first 8 eps or so, was it's own worst enemy, the worst of which is almost straight away. Like ST - the universe is the same after the ep concludes, probably the most common of all sci-fi jibes. Here's a new series that claims to be different... no it aint. I hate this ep on so many deep concieted and personal levels it's untrue! Last edited by mattikake; May 20th 08 at 10:05. It's not even very significant for later eps. Sure it is. It's the first episode that starts the thread about Delenn on the Grey Council, Sinclair's disappearance during the Battle of the Line, etc. "We were right about you," and so forth. And of course the Soul Hunters would come back in that TV movie. Soul Hunter/G'Sten guy is awesome, I love those type of character actors. My biggest complaint about the episode (all my personal opinion, of course) is how much the actors chew the scenery in most scenes (the exception being the lurker funerary scene between Ivanova and Franklin, which for me is the biggest reason I'll rewatch the episode).